Celiac disease is a human T cell–mediated autoimmune-like disorder caused by exposure to dietary gluten in genetically predisposed individuals. This review will discuss how CD4 T cell responses directed against an exogenous Ag can cause an autoreactive B cell response and participate in the licensing of intraepithelial lymphocytes to kill intestinal epithelial cells. Furthermore, this review will examine the mechanisms by which intraepithelial cytotoxic T cells mediate tissue destruction in celiac disease. Celiac disease (CD) is a multifactorial and polygenic disorder that is caused by an immune response to ingested cereal gluten proteins of wheat (gliadins and glutenins), barley (hordeins), and rye (secalins) (1–3). Both MHC and non-MHC genes contribute to the genetic predisposition (4, 5). CD is increasingly considered a systemic disorder although the main pathological lesion is located in the proximal small intestine. In the most developed lesion, there is loss of intestinal villi and infiltration of leukocytes, both in the epithelium and the lamina propria. Whereas in graft versus host disease, intestinal transplant rejection and autoimmune enteropathy crypt epithelial cells are generally the primary target of the immune response, CD is associated with crypt hyperplasia. Many patients have less overt changes. In some cases the only histological change observed is an infiltration of the epithelium. Previously, the diagnosis required the detection of gut histopathology, but as CD patients produce highly disease-specific Abs, serology is increasingly used in the diagnostic workup. CD patients develop IgA and IgG Abs directed against gluten peptides as well as an autoantigen, transglutaminase 2 (TG2) (6). In children, the diagnosis can now be made without a requirement for gut biopsy examination if a high titer of serum IgA anti-TG2 Abs is present (7). Importantly, upon removal of gluten from the diet, the Abs and the histological alterations recede, and the changes reoccur upon reintroduction of dietary gluten, indicating that gluten is the driver of the disease (8). MHC was identified as a risk locus for CD nearly 50 y ago (9, 10). The primary association is with certain MHC class II alleles encoding HLA-DQ2.5 (HLA-DQA1*05/HLA-DQB1*02), HLA-DQ8 (HLA-DQA1*03/HLA-DQB1*03:02), and HLA-DQ2.2 (HLA-DQA1*02:01/HLA-DQB1*02) (11–14). The risk for CD is particularly high for HLA-DQ2.5. This HLA molecule can be encoded either in cis in DR3DQ2 individuals or in trans in DR5DQ7/DR7DQ2 individuals (12). There is also a gene dosage effect of MHC in CD with increased risk in HLA homozygous individuals (14, 15). Genome-wide association studies have so far identified 42 loci in addition to the MHC that contribute to CD susceptibility (5, 16). Many of the non-MHC loci are shared with other autoimmune diseases (5). MHC accounts for ~40% of the genetic variance, whereas the established non-MHC loci collectively account for another 15% of the genetic risk (16). Each of the non-MHC loci has very little size effect, and interestingly, most of the CD-associated single nucleotide polymorphisms are located to nonexon, intergenic regions where they likely exert their effect by regulating gene expression, particularly in T cells and B cells (16, 17) (Fig. 1). Integration of CD-associated genes involved in CD pathogenesis by affecting T cell regulation, T cell responses, and T-B cell interactions. Shown in red are non-HLA candidate genes identified by genome-wide association studies and known to be involved in thymic T cell differentiation (Themis and Runx3), T cell activation (SH2B3, TAGAP, PTPN2, CD28, CTLA4, CIITA, IL2/IL21), differentiation of inflammatory CD4 T cells (IRAK1, IL12A, IL18RAP/IL18R1, IL1RL1/IL1RL2, STAT4), B cell activation and differentiation (ICOS/ICOSLG, CD28, IL21/IL2, IRF4, RGS1, BACH2, ARHGAP31, POU2AF1), and effector cytolytic T cell migration and functions (IL21/IL2, RGS1, MAP3K7, CCR1/2/3, CCR4, UBASH3). Names of candidate genes are indicated according to their potential involvement in immunological pathways. Sites depicted include sites of T cell differentiation (thymus), T and B cell priming (lymph nodes), and the intestinal mucosa. Genetically predisposed individuals can develop the condition from early childhood to old age. The CD-predisposing HLA-DQ allotypes are prevalent, yet only a fraction of the carriers develops disease. This suggests that non-MHC genes and/or nongluten environmental factors are involved in the development of disease (3). The strong MHC class II association and functional evidence point to the involvement of gluten-specific CD4 T cells in the pathogenesis of CD. Although activation of these cells probably is a prerequisite, the villous atrophy is caused by epithelial cell destruction, likely mediated by intraepithelial CTLs (IE-CTLs) that are not gluten specific (18). Thus CD offers a unique opportunity to decipher how CD4 T cell responses directed against an exogenous Ag can drive autoimmune reactions like autoantibody production and tissue destruction (8). It also offers a unique window into our understanding of the regulation of tissue-resident IE-CTLs and the mechanisms by which they can mediate tissue destruction based on the recognition of stress signals and not cognate Ag. In the following sections, we will discuss how TCR αβ CD4 and CD8 T cells are involved in the pathogenesis of CD. Gluten Ag recognition by CD4 T cells. Early attempts to generate gluten-reactive T cells in CD patients by stimulation of PBMCs did not convincingly demonstrate that gluten-reactive T cells represent a CD-specific phenomenon. It was not until T cells were generated by gluten stimulation of gut biopsies that a consistent result was obtained (19). Gluten-reactive CD4 T cells could be generated from CD patients in remission, but not from controls and notably all the gluten-reactive T cells were restricted by the disease-associated DQ2.5 molecule in DQ2.5-positive subjects. The identification of the peptide binding motif of DQ2.5 revealed that this molecule has preference for binding peptides with negatively charged residues at the anchor positions P4, P6, and P7 (20–22). Gluten proteins are sparse in negatively charged residues, disqualifying this Ag for presentation by DQ2.5. Identification of the first gluten epitope presented by DQ2.5 gave a hint for an explanation as it indicated that deamidation was involved, although the mechanism was not identified (23). Soon after, it was discovered that the TG2, which had been identified to be the target for autoantibodies in CD (6), specifically deamidates gluten peptides thereby converting them to excellent T cell epitopes (24, 25) (Fig. 2). The recognition motif of TG2 for targeting glutamine residues in polypeptides was determined to be QXP where Q is the residue targeted by the enzyme (26, 27) (Fig. 2A). Gluten proteins are exceptionally rich in such sequence motifs, which was suggested to be a reason why gluten is harmful to CD patients (26). In the following years a number of unique DQ2.5 restricted epitopes were characterized (28–33). It was observed that CD patients have intestinal T cell responses to a fairly large number of epitopes, but with individual variation in the response pattern. Some epitopes, like DQ2.5-glia-α1 and DQ2.5-glia-α2, gave consistently high responses in the majority of the patients and these were considered to be immunodominant epitopes (1) (Fig. 2). Posttranslational modification and T cell recognition of deamidated gluten peptides in CD. In (A) schematic representation is given whereas in (B) interactions based on a crystal structure (PDB: 4OZH) are depicted. Transglutaminase 2 (TG2) mediates deamidation of gluten peptides by targeting glutamine residues (Q) preferentially in the sequence QXP (X is any amino acid, P is proline) and converting them to glutamate (E). Shown is a sequence that gives rise to the DQ2.5-glia-α2 epitope. This epitope docks in the peptide binding site of the HLA-DQ2.5 molecule with the generated glutamate residue (p4-E, in red) buried in the P4 pocket. On recognition of the peptide-MHC complex, the TCR of a T cell clone (S16) (69) makes contact with three peptide residues (in green; glutamine [Q] at position 2, a leucine [L] at position 5 and a tyrosine [Y] at position 7). Of note, the side chain of this tyrosine residue is only partially visible in this structure representation. An arginine residue of the TCR CDR3β loop (R109β, blue) is particularly involved in the interaction making contact to both DQ2.5 residues and the p5-L residue. As can be seen (B), this TCR residue does not interact directly with the p4-E residue of the peptide. The first DQ8-restricted epitope identified was recognized by T cell clones of CD patients in its native sequence (34). However, with the discovery that TG2 mediates deamidation of gluten peptides, it was also realized that this epitope was better recognized in a deamidated form where the introduced glutamate residues are located at positions P1 and P9 of the epitope sequence (25). Initially it was thought that T cell epitopes of DQ2.5 CD patients are recognized also by T cells of DQ2.2 CD patients. In a standard proliferative assay with T cells, APCs, and peptide Ags added at the same time, T cell clones of DQ2.5 patients generally responded when the epitopes were presented by DQ2.2-expressing APCs. However, the reverse turned out not to be case. Gluten-reactive T cells of DQ2.2 CD patients were found not to respond to DQ2.5-restricted T cell epitopes (35). Rather T cell clones of DQ2.2 patients recognized a unique set of gluten epitopes that commonly had a serine residue at position P3 (35, 36). This finding corresponded with studies of the peptide binding preference of DQ2.5 and DQ2.2; DQ2.2 uniquely utilizes serine as an anchor at position P3 (22, 37). From the comparative studies of epitopes restricted by DQ2.5 and DQ2.2, it became clear that stable binding of the peptides to the HLA molecule is essential for making an in vivo response to an epitope. In assays addressing the functional kinetic stability of the peptide-MHC complexes, the DQ2.5-restricted epitopes could only be presented by DQ2.5-expressing APCs and not by DQ2.2-expressing APCs and the converse was observed for DQ2.2-restricted epitopes (35, 36, 38). High functional kinetic stability would allow more peptide-MHC complexes to survive at the surface of APCs indicating that the quantity of peptide-MHC matters for the initiation of disease. This further is supported by evidence of better T cell stimulation by DQ2.5 homozygous APCs compared with DQ2.5 heterozygous APCs (39). This fact likely explains the observed gene dosage of MHC in CD. Initially the identification of CD-relevant T cell epitopes was done with T cells derived from gut biopsies. The same type of T cells could not be identified in peripheral blood by proliferation assay or ELISPOT assay. However, these cells could be detected in an IFN-γ ELISPOT assay at day 6 in patients in remission following a 3-day oral gluten challenge (40–42). This approach was used to comprehensively map the T cell response to the gluten proteome in DQ2.5 CD patients including sequences from barley (hordeins) and rye (secalins) in addition to wheat gliadin and glutenin sequences (33). A hierarchy among the T cell epitopes was found and the epitopes DQ2.5-glia-α1, DQ2.5-glia-α2 (Fig. 2A, 2B), DQ2.5-glia-ω1, DQ2.5-glia-ω2, and DQ2.5-hor-3 were classified to be immunodominant. A comprehensive listing of all HLA-DQ–restricted T cell epitopes recognized by T cells of CD patients with a new nomenclature and the original names of the epitopes has been published (43). Gluten-reactive CD4 T cells and anti-TG2 autoantibodies. Hardly coincidental, TG2 in CD is the target for autoantibodies and instrumental in creating T cell epitopes. TG2 can both cross-link (transamidate) and deamidate glutamine-containing peptides (44), and TG2 can form complexes with gluten peptides (6). A model where covalent complexes of TG2 and gluten peptides act as hapten-carrier–like complexes in the crosstalk between T cells and B cells incorporates this duality (45, 46). In this model, TG2-specific B cells can present gluten peptides via HLA-DQ molecules to gluten-reactive T cells after uptake of gluten-TG2 complexes by their surface anti-TG2 Ig molecules. TG2-specific B cells will in this way receive T cell help which could explain why these Abs are only formed in individuals who are HLA-DQ2/DQ8 and who are eating gluten (46). Recently it was demonstrated that TG2 is a preferred substrate for itself allowing for efficient generation of multimeric TG2-TG2 complexes—and in the presence of gluten peptides—to the generation of multimeric TG2 complexes that are decorated with gluten peptides (47). These gluten-TG2 complexes were found in vitro to be effective Ags for TG2-specific B cell transfectants and the presentation of gluten epitopes to gluten-reactive T cells. A variant of this model, based on the observation that IgD is a substrate for TG2, suggested that IgD-expressing anti-TG2 B cells would direct the enzyme to cross-link gluten peptides to the hinge region of its own IgD molecules (48). In this process, a TG2-specific B cell would de facto act as a gluten-specific B cell and thereby receive the required T cell help. Common to both models is that the enzyme’s specificity is key to facilitate the highly effective B cell–mediated presentation of gluten epitopes to T cells. Both models also would explain formation of TG2 Abs as part of a T cell response to gluten. An alternative model to explain formation of TG2 autoantibodies is the involvement of autoreactive TG2-specific CD4 T cells. Although some reports have indicated that TG2-reactive CD4 T cells do exist (49, 50), experiments from one of the author’s laboratory have failed to identify TG2-reactive T cells in T cell lines made from intestinal biopsies (M. Ráki and L.M. Sollid, unpublished observations). Important theoretical considerations further speak against the existence of autoreactive TG2-specific T cells. First, there is prominent expression of TG2 in the thymus (51, 52) arguing for strong negative selection of TG2-specific T cells. Second, gluten dependence and HLA-DQ2/8 dependence of anti-TG2 Abs speaks against a role for TG2-autoreactive T cells in CD pathogenesis. Finally, there is no known generalized T cell autoimmunity to this ubiquitously expressed Ag. Factors determining the selection of CD4 gluten T cell epitopes. The gluten proteome has an enormous complexity, yet the CD4 T cells recognize a limited set of peptides. Thus there must be strong selection for which sequences become T cell epitopes. Selection by MHC appears very important, as the pattern of epitope recognition in different patients is contingent on which HLA-DQ molecule they express (53). Another factor is proteolytic stability of polypeptides. The T cell epitopes are confined to regions of gluten proteins rich in proline residues (30). Proline-rich polypeptides are poorly handled by the gut proteases and T cell epitopes are typically located within long, proteolytically stable peptide fragments (54). These long fragments are also targeted by CD-specific anti-gluten Abs (55). Sequences such as PQPEQPFP (the glutamate residue introduced by TG2-mediated deamidation) are typically expressed multiple times in these long, proline-rich gluten fragments, hence constituting multivalent B cell epitopes. Gliadin-specific B cells may therefore be important for selection of the T cell epitopes. TG2-specific B cells may also be involved in selection of gluten T cell epitopes as, according to the above described hapten-carrier model, such cells will be important APCs for gluten-specific T cells. Finally, the specificity of TG2 appears to be very important for selection of T cell epitopes and consequently T cells (Fig. 2A, 2B). On the top of the list of preferred TG2 substrates from a very complex digest of gluten, known T cell epitopes strongly dominated and several new T cell epitopes were identified among top-ranked peptides (56). Gluten:HLA-DQ tetramers for detection of T cells. Gluten:HLA-DQ tetramers made with leucine zippers to replace the transmembrane region and with an Ag peptide covalently tethered with the DQβ-chain give specific and high intensity staining of gluten-reactive T cells (57). These reagents have proven very versatile in basic science orientated studies (58–65) and in clinically related studies (66, 67) of T cells in CD. Initially, T cells could successfully be detected in peripheral blood of treated CD patients after gluten challenge (58) similar to the observation done with ELISPOT detection (41). Later by use of bead enrichment to increase assay sensitivity, tetramer positive cells could be detected in the blood of both treated and untreated CD patients without an oral gluten challenge (67). Studies of peripheral blood of controls with gluten:HLA-DQ tetramer staining and functional studies of isolated cells led to the conclusion that healthy subjects lack regulatory and memory T cells specific for deamidated immunodominant gluten epitopes of CD (64). Finally, gluten:HLA-DQ tetramers have been used to stain single cell suspension of gut biopsies. It was determined that gluten-specific T cells are present in biopsies of all untreated CD patients at a frequency of 0.1–1.2% of CD4 T cells, and the results were concordant with results obtained by direct cloning of T cells (60). Stereotyped TCR usage by gluten-reactive CD4 T cells. Analysis of the responses to DQ8-glia-α1 and DQ2.5-glia-α2 revealed biased usage of the TCRβ gene segments TRBV9 and TRBV7-2, respectively (59, 68). Many of DQ2.5-glia-α2–reactive T cells employing the TRBV7-2 gene segment had a conserved sequence in their CDR3β loop, with a particularly notable conservation of a nongermline-encoded arginine residue (59) as confirmed in independent studies (61, 69) (Fig. 2B). Among the cells with the conserved CDR3β loop with the arginine residue, there was also a biased usage of TRAV26-1 resulting in many DQ2-glia-α2 using the TRAV26-1/TRBV7-2 pair (62). Isolation of single DQ2.5-glia-α2–reactive T cells in peripheral blood after oral gluten challenge of treated CD patients by gluten:HLA-DQ tetramers revealed that about half of the T cells belonged to expanded clones, many of which used the TRAV26-1/TRBV7-2 pair (65). Comparative analysis by cell isolation with gluten:HLA-DQ tetramers of the homologous but rarely cross-reactive DQ2.5-glia-ω2 epitope revealed similar clonal expansions, but usage of different TRAV and TRBV gene segments and no obvious pairing preference (65). The biased TRAV and TRBV usage, and in particular the TRAV/TRBV preference among some gluten-reactive TCRs, is striking. As the generation of the TCR repertoire is based on a stochastic process, it has been suggested that the development of CD thus might depend on the random generation of high-affinity TCRs specific for particular gluten epitopes (70). This can contribute to explain why only a fraction of subjects carrying CD-predisposing HLA-DQ allotypes develops the disease. Structure of peptide, MHC, and TCR molecules. Structural studies of peptides, MHCs, and TCRs involved in CD have given fundamental insights into the immunologic basis of the disease. The first x-ray crystal structure obtained was of the HLA-DQ2.5 molecule complexed with the DQ2.5-glia-α1a epitope (71). This structure provided understanding at an atomic level on why HLA-DQ2.5 has a preference for anchor residues with a negative charge at the P6 position employing the unique DQβ71 lysine residue, and it provided the conceptual framework to understand how productive MHC class II interaction can take place with a proline-rich peptide. Of note, a proline with its ring structure cannot partake in hydrogen bonds between conserved MHC residues and the amide hydrogens of the main chain, resulting in proline positioning within the HLA-DQ2.5 binding site following a strict pattern. The first structure of the trimolecular peptide-MHC-TCR complex was of HLA-DQ8, the DQ8-glia-α1 epitope, and a TCR using the biased TRBV9 gene segment (68). It was found that the TCR docks in a conventional way centrally above the peptide-MHC complex with all CDRβ loops interacting with the peptide. A subsequent study employed gluten:HLA-DQ tetramers to sort DQ8-glia-α1 epitope–specific T cells and it reported structural analysis of the prototype TCR with and without usage of the TRBV9 gene segment (63). It was found that TRBV9 preferentially paired with TRAV26-2, and further that TRBV9-negative T cells had a bias in usage of the TRAV8-3/TRBV6-1 pair. Both types of TCR had a nongermline-encoded arginine residue in CDR3 of either the TCRα or the TCRβ, which, due to distinct docking modes of the two types of TCRs, made the same type of contact to the same serine residue of the peptide. Structural analysis of TCRs specific for DQ8-glia-α1 and DQ8.5-glia-γ1 epitopes and that carried a TRAV20/TRBV9 combination were found not to possess a nongermline-encoded arginine in the CDR3 loops, but strikingly they rather had a germline-encoded arginine in the CDR1 loop of their TRAV20-encoded α-chains (72). Hence, it was concluded that diverse TCR gene usage by DQ8-restricted gluten-reactive T cells converges into a consensus binding solution where particular arginine residues are essential. Altogether four structures of DQ2.5-restricted TCRs in complex with peptides and MHCs have been resolved, three specific for the DQ2.5-glia-α2 epitope and one specific for the DQ2.5-glia-α1a epitope (69). All three TCRs specific for DQ2.5-glia-α2 docked centrally above HLA-DQ2.5 and all had a nongermline-encoded arginine in the CDR3β, which acted like a lynchpin in the docking footprint (Fig. 2). The TCR specific for the DQ2.5-glia-α1a epitope docked similarly to the DQ2.5-glia-α2 TCRs; however, the TCRs’ interaction with peptide determinants differed substantially providing a basis for the epitope specificity. Of note, there was no arginine residue in the CDR loops of the DQ2.5-glia-α1a–specific TCR that made essential contact with peptides or MHCs. The structures involving the DQ2.5-glia-α2 epitope further revealed that lysine at DQβ71 is critical for anchoring the glutamate at position P4 of this epitope (73). All the gluten-reactive TCRs of CD patients for which the structure has been resolved have high-affinity interactions with their peptide-MHC complexes, particularly the DQ8-restricted TCRs (63, 68, 69, 72). The latter fact may explain why there is more stringent deamidation dependence of DQ2.5-restricted epitopes compared with that reported for DQ8-restricted epitopes (29, 74). However, still no explanation for the deamidation dependence of the gluten-reactive TCRs has been provided by the existing crystal structures. The general high-affinity interactions seen further point to stringent selection of high-affinity TCR repertoires in CD, which is different from what is seen with TCRs of other autoimmune diseases. Cytokine profile of gluten-reactive CD4 T cells. Early experiments revealed that gluten-reactive CD4 T cell clones primarily produce IFN-γ—a hallmark of TH1 cells—in conjunction with other cytokines such as IL-4, IL-5, IL-10, TNF, and TGF-β (75). A high production of IL-10 by many T cells led to the notion that some of the gluten-reactive T cells represent type 1 regulatory T cells even though they also produce IFN-γ (76). An alternative explanation is that IL-10 is produced by TH1 cells to control themselves (77). Gluten-reactive T cells also produce IL-21, but not IL-17 (78). The same cytokine profile was observed in T cells from biopsies of pediatric CD patients (79). Although the identification of the mechanisms governing the generation of gluten epitopes provides an explanation for how MHC class II–peptide complexes are generated, it does not provide an explanation for why CD patients develop TH1 immunity against gluten. Based on the finding that IL-15 is upregulated in the lamina propria of CD patients (18, 80, 81) and that this cytokine is endowed with proinflammatory properties (82), a humanized HLA-DQ8 mouse model of CD was engineered that overexpressed IL-15 in the lamina propria, but not in the epithelium (83). Conspicuously, intestinal dendritic cells in the presence of IL-15 acquired a proinflammatory phenotype and promoted ex vivo and in vivo TH1 immune responses against dietary Ags without systemic immunization or usage of adjuvants. Strikingly, no TH17 immunity against dietary Ags could be detected in these mice, suggesting that sterile inflammation associated with IL-15 overexpression drives preferentially TH1 immune responses. In addition to IL-15, type 1 IFNs were shown to be upregulated in the mucosa of CD patients (84). Whether viral infections and type 1 IFNs can be an alternative pathway driving independently or in conjunction with IL-15 inflammatory T cell responses against gluten remains to be determined. 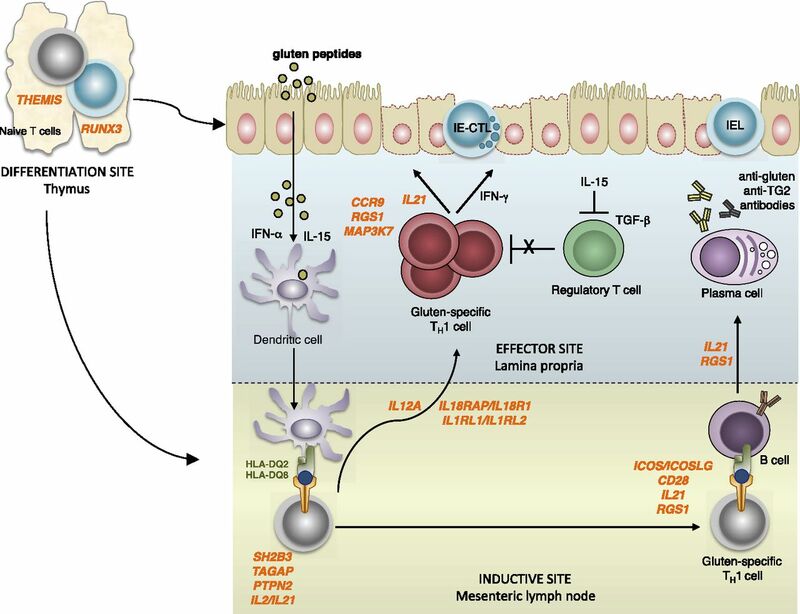 Finally, what drives upregulation of IL-15 and type 1 IFN in the intestinal tissue of CD patients and how it is connected to gluten is not well understood. T cell response to native and deamidated gluten peptides. A question has been whether the initial T cell response is directed against native and not deamidated peptides. Systemic immunization with gliadin peptides in HLA-DQ8 transgenic mice showed that the β57 polymorphism of DQ8 plays a role in the ability to promote response to both native and deamidated gluten peptides, and that the TCR repertoire generated against the native peptide cross-reacted with the deamidated gluten peptides (74). However, it is unlikely that the same phenomenon will be observed with HLA-DQ2.5 given the more pronounced deamidation dependence for DQ2.5-restricted than DQ8-restricted gluten-reactive T cells. Initial studies of T cells from pediatric CD patients indicated a broad response with reactivity toward multiple gliadin and glutenin peptides and recognition of nondeamidated peptides (29), but a recent follow-up study was unable to replicate this finding on deamidation independence of DQ2.5-restricted T cells (85). Studies in mice suggested that TG2 is not constitutively active in the intestine (86), and that activation may be induced by viral signals (86) and IFN-γ (87). What causes TG2 activation in a pathophysiological setting remains to be determined. Intraepithelial T cells are increased in active CD. Two lines of evidence strongly suggest that anti-gluten CD4 T cell immunity is not sufficient for tissue destruction in CD: 1) a subset of CD patients, referred to as potential CD, lack tissue destruction despite evidence for the presence of IgA anti-TG2 Abs and hence anti-gluten CD4 T cell immunity (18, 88, 89); and 2) humanized HLA-DQ2 or HLA-DQ8 animal models with inflammatory anti-gluten CD4 T cell immune responses fail to develop villous atrophy even when those mice expressed a gluten-specific TCR (83, 90, 91). Mostly due to the failure to identify gluten-specific IE-CTLs, the potential role of these cells in the pathogenesis was disregarded despite the fact that their expansion is a hallmark of CD and that they are located at the site of tissue destruction. A solution to this conundrum emerged with the finding that IE-CTLs expressed activating NKRs that could recognize stress-induced ligands (92–94). Later studies confirmed a role for NKRs and their ligands in CD pathogenesis (95–97). These findings in CD led to propose a more general model for the regulation of tissue-resident CTLs (82) (Fig. 3). Tissue-resident intestinal CD8 IE-CTLs mediate killing of epithelial cells based on recognition of stress signals. In lymph nodes, naive CD8 T cells require to receive costimulatory signals via CD28 to become activated and differentiate into cytotoxic effector T cells. In tissues, effector CTLs that have downregulated CD28, require receiving a distinct set of activating signals to unleash their effector functions. These activating signals are provided by activating NKRs NKG2D and CD94/NKG2C, which recognize MICA/B and HLA-E induced on epithelial cells by stress and inflammation in active CD. Under these conditions, activating NKRs enable IE-CTLs that are not gluten specific, to kill intestinal epithelial cells directly or indirectly by lowering the TCR threshold and allowing recognition of low-affinity epithelial or microbial Ags. Involvement of IE-CTLs in pathogenesis. Human IE-CTLs, in contrast to those of mice, do not comprise an evident CD8αα+TCRαβ+ IE-CTL subset; instead the conventional CD8αβ+TCRαβ+ T cell subset express innate c-type lectin NKRs that recognize altered self (98). In particular, under physiological conditions, human IE-CTLs express the dimeric inhibitory CD94/NKG2A receptor and low levels of activating CD94 and NKG2D receptors that have costimulatory functions (92, 93, 99). Importantly, they do not express activating NKRs associated with ITAM-bearing adapter molecules, hence ensuring that proliferation and cytokine secretion remain under the control of the TCR (97, 100). Human IE-CTLs are Ag-driven, highly oligoclonal effector T cells that express CD69 and the integrin CD103 (82, 98), features that are shared by tissue-resident T cells present at mucosal surfaces (101). In CD, IE-CTLs undergo major changes in the nature of the NKRs they express and the functions they can exert. They lose expression of inhibitory CD94/NKG2A receptors (97), and upregulate activating NKG2D (96) and CD94/NKG2C receptors (97). The mechanisms underlying the absence of inhibitory CD94/NKG2A receptors in IE-CTLs remain elusive and may involve gluten-specific CD4 T cells (see Interplay between lamina propria CD4 T cells and intraepithelial CD8 T cells). Activating CD94/NKG2C receptors are associated with the adapter molecule DAP12 that contains an ITAM (102). Their expression in IE-CTLs is associated with a global NK cell reprogramming characterized by the expression of a wide range of NKRs that are normally found in NK cells but not T cells (97) and, may be the result of chronic activation (103). Furthermore, the TCR repertoire of IE-CTLs having undergone NK cell reprogramming is extremely restricted (97). TCR specificity was reported to determine whether T cells express inhibitory or activating NKRs (99, 104), suggesting the intriguing possibility that in CD there is an expansion of IE-CTLs with a particular specificity that remains to be defined. Although CD94/NKG2C and NK cell reprogramming are found only in a subset of CD patients (97), upregulation of NKG2D is a more general feature that is driven by IL-15 upregulation in intestinal epithelial cells (96). IL-15 is a cytokine induced upon stress and inflammation that acts in a cell contact-dependent manner (82, 105). In addition to upregulating transcription of NKG2D and its adapter molecule DAP10 (96), it also costimulates the NKG2D cytolytic signaling pathway (96, 106, 107). Importantly, because DAP10 harbors a PI3-kinase binding motif but lacks an ITAM motif (108), it cannot mediate proliferation and cytokine secretion. However, in IE-CTLs stimulated with IL-15 it can mediate TCR-independent cytolysis (95, 96). Concomitant to the induction of activating NKRs in IE-CTLs, intestinal epithelial cells upregulate MICA/B (95, 96) and HLA-E (97) that are ligands for NKG2D (109) and CD94/NKG2 NKRs (110, 111), respectively. Altogether, these findings indicate that IE-CTLs acquire the ability to destroy distressed epithelial cells based on stress signals independently from their TCR specificity (82, 100). This does not imply that TCRs are not involved, as it has been shown that NKRs and IL-15 can lower the TCR activation threshold and endow CTLs with the ability to kill targets that express IL-15 in a noncognate yet TCR-dependent manner (112), likely through the recognition of low-affinity Ags that would not be able to induce TCR activation in the absence of the costimulatory innate signals. Involvement of the TCRs and recognition of low-affinity Ags may be particularly implicated in promoting the proliferation of IE-CTLs and the secretion of IFN-γ. In active CD, IE-CTLs express the proliferation-associated marker Ki67 (113). Of note, the intriguing observation that gluten challenge results in a recirculation of oligoclonal IE-CTLs (61) does not demonstrate that IE-CTLs are gluten specific, because under physiological and pathological conditions human IE-CTLs are oligoclonal Ag-driven, tissue-resident T cells (97, 99, 114, 115). Future studies will determine whether recirculation of IE-CTLs is dependent on the nature of the Ag or results from tissue inflammation instigated by CD4 T cell activation in the lamina propria. The finding that IE-CTLs can kill epithelial cells, based on recognition of inflammatory and stress signals provides an explanation of how IE-CTLs, without being gluten specific, can play a major role in CD pathogenesis and in particular in epithelial cell destruction (82) (Fig. 3). Interplay between lamina propria CD4 T cells and intraepithelial CD8 T cells. Evidence points to the concomitant requirement of anti-gluten CD4 T cell immunity and tissue distress associated with upregulation of IL-15 and nonclassical MHC class I molecules to endow IE-CTLs with a fully activated killer phenotype (18). For instance, downregulation of inhibitory NKG2A and optimal upregulation of activating NKRs and granzyme may be dependent on the inflammatory anti-gluten CD4 T cell response (18). Furthermore, although a subset of family members of CD patients display increased expression of IL-15 and heat shock proteins in the absence of overt anti-gluten CD4 T cell immunity, they fail to upregulate HLA-E and MICA/B (18). Gluten-specific CD4 T cells produce IL-21 that is reported to increase cytolytic properties in NK cells and CTLs (116), and IFN-γ that upregulates HLA-E expression (117). Intriguingly, IL-15 upregulation by intestinal epithelial cells in family members of CD patients was only found in individuals bearing the CD-associated HLA-DQ allotypes (18). Furthermore, HLA-DQ2.5 homozygosity was shown to predispose to refractory-type CD (118), a complication of CD that is dependent on IL-15 (81). These observations suggest that there may be a link between the anti-gluten-CD4 T cell response and IL-15 upregulation in intestinal epithelial cells. However, it is also possible that MHC-encoded genes other than HLA-DQA1/DQB1 may partake in IL-15 regulation, and that, epithelial cell anomalies may occur independently from anti-gluten CD4 T cell immunity in a subset of CD patients. Some evidence for this comes from observations of family members of CD patients, who did not have elevated levels of serum IgA anti-TG2 as a proxy for lacking anti-gluten CD4 T cell immunity, yet they had epithelial alterations, whereas other potential CD patients with IgA anti-TG2 showed no signs of epithelial distress (18). Finally, the lower levels of IgA anti-TG2 Abs observed in potential CD patients likely reflect a smaller amplitude of the anti-gluten CD4 T cell response in these patients than in patients with active CD. Whether absence of epithelial distress and IE-CTL activation play an important role in the amplification of the anti-gluten CD4 T cell response remains to be determined. Future studies, likely including studies with relevant animal models of CD, will help dissect the role of the interplay between anti-gluten CD4 T cells and IE-CTLs in epithelial cell destruction and development of villous atrophy. Specificity and role of anti-gluten CD8+ T cells. Although no reports of gluten-specific IE-CTLs exist, scanning of gluten proteins for sequences that can bind MHC class I allotypes has identified candidate peptides that can be recognized by CD CD8+ T cells of the lamina propria (119). In particular, a-gliadin 123–132-reactive CD8+ T cells could be grown from biopsies of both treated and untreated CD patients (119). Even though in vitro stimulation of biopsies with this peptide induced apoptosis of enterocytes, immunohistochemical analysis revealed that the CD8 T cells reactive to this peptide were located in the lamina propria beneath the epithelium (120). HLA-A2 does not show association with CD, raising the question whether this type of response has a primary involvement in CD pathogenesis. Furthermore, the location of these CD8+ T cells in the lamina propria and not in the epithelium where tissue destruction resides, does not favor a direct role of these cells in epithelial cell destruction. A further characterization of their functional cytokine profile and cytolytic phenotype will help define their role in CD. The genetic, clinical, and laboratory findings in CD are compatible with CD being a condition that is driven by gluten CD4-reactive T cells and where the CD4 T cells are interplaying with B cells and also CD8 T cells. The different genetic risks of the HLA-DQ2.5, HLA-DQ8, and HLA-DQ2.2 allotypes can be explained by the amount of gluten-HLA complexes displayed to the CD4 T cells. The involvement of B cells, contingent on the help they receive from CD4 T cells, leads to Ab production to TG2. Importantly the B cell involvement will serve as an amplifying loop for the T cells. This amplifying loop will select for peptides being good substrates for TG2 as T cell epitopes. Together these observations point to the anti-gluten T cell response needing to reach a certain magnitude to become pathogenic. The importance of the magnitude of the anti-gluten T cell response is further supported by the strong gene dosage effect observed for HLA allotypes in CD. 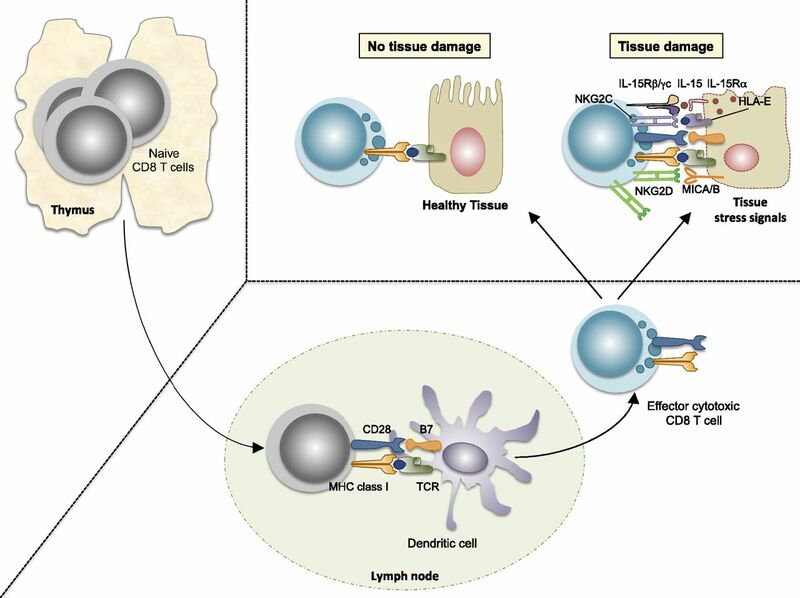 Although CD4 T cells are likely critical for IE-CTLs to become operative effector T cells, there are signals provided by the epithelium, independent of CD4 T cells, that seem to be required for tissue destruction. In particular, IL-15 and nonclassical MHC class I molecules recognized by activating NKRs expressed by CTLs function as danger signals that regulate tissue-resident CD8 T cells and tissue destruction. This checkpoint, that probably has evolved to cope with infections, enables CTLs to selectively kill distressed tissue cells that have downregulated their MHC class I molecules as seen in the context of viral infections. In CD the factors needed to unleash this program seem to be maintained by the exposure to gluten. The autoimmune type of genetics in combination with anti-TG2 autoantibodies and the selective destruction of surface epithelial cells would make CD a prototypic organ-specific autoimmune disorder if it were not for the knowledge that an exogenous dietary Ag, gluten, is the driver of the disease. CD provides a unique human model of organ-specific autoimmunity that gives important insights into our understanding of MHC association, the role of posttranslational modifications, and the mechanisms underlying the regulation of tissue-resident CTLs and tissue destruction. We thank patients with CD and their families for supporting the research. We thank Dr. Valerie Abadie for critical reading of the manuscript and help in the generation of the figures. B.J. was supported by the National Institutes of Health (Grants R01 DK067180, R01 DK 098435, R01 DK100619, and P30 DK42086). L.M.S. was supported by the Research Council of Norway (partially through its Center of Excellence funding scheme, Grant 179573/V40), the European Commission (Grant ERC-2010-Ad-268541), the South-Eastern Norway Regional Health Authority, and Stiftelsen K.G. Jebsen. 2000. Molecular basis of celiac disease. Annu. Rev. Immunol. 18: 53–81. 2007. Celiac disease: pathogenesis of a model immunogenetic disease. J. Clin. Invest. 117: 41–49.
. 2011. Integration of genetic and immunological insights into a model of celiac disease pathogenesis. Annu. Rev. Immunol. 29: 493–525.
. 2009. Recent advances in coeliac disease genetics. Gut 58: 473–476.
. 2016. Understanding celiac disease by genomics. Trends Genet. 32: 295–308.
. 1997. Identification of tissue and as the autoantigen of celiac disease. Nat. Med. 3: 797–801.
. 2012. European Society for Pediatric Gastroenterology, Hepatology, and Nutrition guidelines for the diagnosis of coeliac disease. J. Pediatr. Gastroenterol. Nutr. 54: 136–160.
. 2013. Triggers and drivers of autoimmunity: lessons from coeliac disease. Nat. Rev. Immunol. 13: 294–302.
. 1972. Predominance of histocompatibility antigen HL-A8 in patients with gluten-sensitive enteropathy. J. Clin. Invest. 51: 1602–1605.
. 1972. Histocompatibility antigens associated with adult coeliac disease. Lancet 2: 162–164.
. 1983. Evidence that celiac disease is primarily associated with a DC locus allelic specificity. Clin. Immunol. Immunopathol. 28: 395–404.
. 1989. Evidence for a primary association of celiac disease to a particular HLA-DQ α/β heterodimer. J. Exp. Med. 169: 345–350.
. 1992. HLA-DR and -DQ genotypes of celiac disease patients serologically typed to be non-DR3 or non-DR5/7. Hum. Immunol. 35: 188–192.
. 2003. HLA types in celiac disease patients not carrying the DQA1*05-DQB1*02 (DQ2) heterodimer: results from the European Genetics Cluster on Celiac Disease. Hum. Immunol. 64: 469–477.
. 1993. On the HLA-DQ(α1*0501, β1*0201)-associated susceptibility in celiac disease: a possible gene dosage effect of DQB1*0201. Tissue Antigens 41: 173–177.
. 2011. Dense genotyping identifies and localizes multiple common and rare variant association signals in celiac disease. Nat. Genet. 43: 1193–1201.
. 2015. Systematic annotation of celiac disease loci refines pathological pathways and suggests a genetic explanation for increased interferon-gamma levels. Hum. Mol. Genet. 24: 397–409.
. 2015. Distinct and synergistic contributions of epithelial stress and adaptive immunity to functions of intraepithelial killer cells and active celiac disease. Gastroenterology 149: 681–691.e10.
. 1993. Gliadin-specific, HLA-DQ(α1*0501,β 1*0201) restricted T cells isolated from the small intestinal mucosa of celiac disease patients. J. Exp. Med. 178: 187–196.
. 1996. Identification of a putative motif for binding of peptides to HLA-DQ2. Int. Immunol. 8: 177–182.
. 1996. The peptide binding motif of the disease associated HLA-DQ (α 1* 0501, β 1* 0201) molecule. Eur. J. Immunol. 26: 2764–2772.
. 1997. Unique peptide binding characteristics of the disease-associated DQ(α1*0501, β1*0201) vs the non-disease-associated DQ(α1*0201, β1*0202) molecule. Immunogenetics 46: 484–492.
. 1998. Identification of a gliadin T-cell epitope in coeliac disease: general importance of gliadin deamidation for intestinal T-cell recognition. Scand. J. Immunol. 48: 111–115.
. 1998. Tissue transglutaminase selectively modifies gliadin peptides that are recognized by gut-derived T cells in celiac disease. Nat. Med. 4: 713–717.
. 1998. Selective deamidation by tissue transglutaminase strongly enhances gliadin-specific T cell reactivity. J. Immunol. 161: 1585–1588.
. 2002. Specificity of tissue transglutaminase explains cereal toxicity in celiac disease. J. Exp. Med. 195: 643–649.
. 2002. Gliadin T cell epitope selection by tissue transglutaminase in celiac disease. Role of enzyme specificity and pH influence on the transamidation versus deamidation process. J. Biol. Chem. 277: 34109–34116.
. 2000. The intestinal T cell response to α-gliadin in adult celiac disease is focused on a single deamidated glutamine targeted by tissue transglutaminase. J. Exp. Med. 191: 603–612.
. 2002. The gluten response in children with celiac disease is directed toward multiple gliadin and glutenin peptides. Gastroenterology 122: 1729–1737.
. 2002. Celiac lesion T cells recognize epitopes that cluster in regions of gliadins rich in proline residues. Gastroenterology 123: 803–809.
. 2005. Refining the rules of gliadin T cell epitope binding to the disease-associated DQ2 molecule in celiac disease: importance of proline spacing and glutamine deamidation. J. Immunol. 175: 254–261.
. 2005. T-cell recognition of HLA-DQ2-bound gluten peptides can be influenced by an N-terminal proline at p-1. Immunogenetics 57: 8–15.
. 2010. Comprehensive, quantitative mapping of T cell epitopes in gluten in celiac disease. Sci. Transl. Med. 2: 41ra51.
. 1998. Small intestinal T cells of celiac disease patients recognize a natural pepsin fragment of gliadin. Proc. Natl. Acad. Sci. USA 95: 10050–10054.
. 2012. T-cell response to gluten in patients with HLA-DQ2.2 reveals requirement of peptide-MHC stability in celiac disease. Gastroenterology 142: 552–561.
. 2014. HLA-DQ molecules as affinity matrix for identification of gluten T cell epitopes. J. Immunol. 193: 4497–4506.
. 2015. Different binding motifs of the celiac disease-associated HLA molecules DQ2.5, DQ2.2, and DQ7.5 revealed by relative quantitative proteomics of endogenous peptide repertoires. Immunogenetics 67: 73–84.
. 2009. Differences in the risk of celiac disease associated with HLA-DQ2.5 or HLA-DQ2.2 are related to sustained gluten antigen presentation. Nat. Immunol. 10: 1096–1101.
. 2003. The HLA-DQ2 gene dose effect in celiac disease is directly related to the magnitude and breadth of gluten-specific T cell responses. Proc. Natl. Acad. Sci. USA 100: 12390–12395.
. 2000. In vivo antigen challenge in celiac disease identifies a single transglutaminase-modified peptide as the dominant A-gliadin T-cell epitope. Nat. Med. 6: 337–342.
. 2005. T cells in peripheral blood after gluten challenge in coeliac disease. Gut 54: 1217–1223.
. 2009. Intestinal T cell responses to gluten peptides are largely heterogeneous: implications for a peptide-based therapy in celiac disease. J. Immunol. 182: 4158–4166.
. 2012. Nomenclature and listing of celiac disease relevant gluten T-cell epitopes restricted by HLA-DQ molecules. Immunogenetics 64: 455–460.
. 2003. Transglutaminases: crosslinking enzymes with pleiotropic functions. Nat. Rev. Mol. Cell Biol. 4: 140–156. 1992. Autoantibodies as markers of coeliac disease autoimmunity. In Seventh International Symposium on Coeliac Disease. Feighery C., C. O’Farelly, eds. Oak Tree Press, Dublin, Ireland. 246–252.
. 1997. Autoantibodies in coeliac disease: tissue transglutaminase--guilt by association? Gut 41: 851–852.
. 2015. Enhanced B-cell receptor recognition of the autoantigen transglutaminase 2 by efficient catalytic self-multimerization. PLoS One 10: e0134922.
. 2015. Igs as substrates for transglutaminase 2: implications for autoantibody production in celiac disease. J. Immunol. 195: 5159–5168.
. 2010. Isolation and characterization of circulating tissue transglutaminase-specific T cells in coeliac disease. Int. J. Immunopathol. Pharmacol. 23: 179–191.
. 2014. Characterisation of tissue transglutaminase-reactive T cells from patients with coeliac disease and healthy controls. Clin. Immunol. 154: 155–163.
. 1989. Differential expression of tissue transglutaminase in human cells. An immunohistochemical study. Cell Tissue Res. 255: 215–224.
. 1997. Differential expression of tissue transglutaminase during in vivo apoptosis of thymocytes induced via distinct signalling pathways. FEBS Lett. 404: 307–313.
. 2006. HLA-DQ2 and -DQ8 signatures of gluten T cell epitopes in celiac disease. J. Clin. Invest. 116: 2226–2236.
. 2002. Structural basis for gluten intolerance in celiac sprue. Science 297: 2275–2279.
. 2016. Gluten-specific antibodies of celiac disease gut plasma cells recognize long proteolytic fragments that typically harbor T-cell epitopes. Sci. Rep. 6: 25565.
. 2010. The preferred substrates for transglutaminase 2 in a complex wheat gluten digest are peptide fragments harboring celiac disease T-cell epitopes. PLoS One 5: e14056.
. 2001. Staining of celiac disease-relevant T cells by peptide-DQ2 multimers. J. Immunol. 167: 4861–4868.
. 2007. Tetramer visualization of gut-homing gluten-specific T cells in the peripheral blood of celiac disease patients. Proc. Natl. Acad. Sci. USA 104: 2831–2836.
. 2011. Posttranslational modification of gluten shapes TCR usage in celiac disease. J. Immunol. 187: 3064–3071.
. 2013. Direct cloning and tetramer staining to measure the frequency of intestinal gluten-reactive T cells in celiac disease. Eur. J. Immunol. 43: 2605–2612.
. 2013. Dietary gluten triggers concomitant activation of CD4+ and CD8+ αβ T cells and γδ T cells in celiac disease. Proc. Natl. Acad. Sci. USA 110: 13073–13078.
. 2014. Biased usage and preferred pairing of α- and β-chains of TCRs specific for an immunodominant gluten epitope in coeliac disease. Int. Immunol. 26: 13–19.
. 2015. Determinants of gliadin-specific T cell selection in celiac disease. J. Immunol. 194: 6112–6122.
. 2016. Healthy HLA-DQ2.5+ subjects lack regulatory and memory T cells specific for immunodominant gluten epitopes of celiac disease. J. Immunol. 196: 2819–2826.
. 2016. TCR sequencing of single cells reactive to DQ2.5-glia-α2 and DQ2.5-glia-ω2 reveals clonal expansion and epitope-specific V-gene usage. Mucosal Immunol. 9: 587–596.
. 2011. Assessing possible celiac disease by an HLA-DQ2-gliadin tetramer test. Am. J. Gastroenterol. 106: 1318–1324.
. 2014. Tetramer-visualized gluten-specific CD4+ T cells in blood as a potential diagnostic marker for coeliac disease without oral gluten challenge. United European Gastroenterol. J. 2: 268–278.
. 2012. Biased T cell receptor usage directed against human leukocyte antigen DQ8-restricted gliadin peptides is associated with celiac disease. Immunity 37: 611–621.
. 2014. 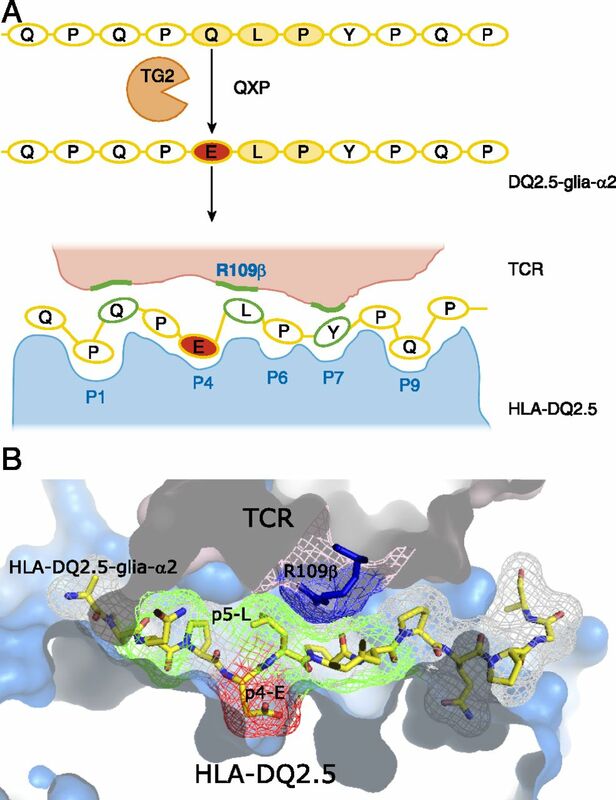 T-cell receptor recognition of HLA-DQ2-gliadin complexes associated with celiac disease. Nat. Struct. Mol. Biol. 21: 480–488.
. 2016. A biased view toward celiac disease. Mucosal Immunol. 9: 583–586.
. 2004. Structural basis for HLA-DQ2-mediated presentation of gluten epitopes in celiac disease. Proc. Natl. Acad. Sci. USA 101: 4175–4179.
. 2016. Diverse T cell receptor gene usage in HLA-DQ8-associated celiac disease converges into a consensus binding solution. Structure 24: 1643–1657.
. 2014. How T cells taste gluten in celiac disease. Nat. Struct. Mol. Biol. 21: 429–431.
. 2008. The role of HLA-DQ8 β57 polymorphism in the anti-gluten T-cell response in coeliac disease. Nature 456: 534–538.
. 1995. Gluten specific, HLA-DQ restricted T cells from coeliac mucosa produce cytokines with Th1 or Th0 profile dominated by interferon gamma. Gut 37: 766–776.
. 2006. Gliadin-specific type 1 regulatory T cells from the intestinal mucosa of treated celiac patients inhibit pathogenic T cells. J. Immunol. 177: 4178–4186.
. 2007. T(H)1 cells control themselves by producing interleukin-10. Nat. Rev. Immunol. 7: 425–428.
. 2010. HLA-DQ2-restricted gluten-reactive T cells produce IL-21 but not IL-17 or IL-22. Mucosal Immunol. 3: 594–601.
. 2013. Increased production of interleukin-21, but not interleukin-17A, in the small intestine characterizes pediatric celiac disease. Mucosal Immunol. 6: 1202–1213.
. 2000. Interleukin 15 mediates epithelial changes in celiac disease. Gastroenterology 119: 996–1006.
. 2003. Interleukin 15: a key to disrupted intraepithelial lymphocyte homeostasis and lymphomagenesis in celiac disease. Gastroenterology 125: 730–745.
. 2015. IL-15 functions as a danger signal to regulate tissue-resident T cells and tissue destruction. Nat. Rev. Immunol. 15: 771–783.
. 2011. Co-adjuvant effects of retinoic acid and IL-15 induce inflammatory immunity to dietary antigens. Nature 471: 220–224.
. 2001. Role of interferon alpha in promoting T helper cell type 1 responses in the small intestine in coeliac disease. Gut 48: 425–429.
. 2015. Consistency in polyclonal T-cell responses to gluten between children and adults with celiac disease. Gastroenterology 149: 1541–1552.e2.
. 2008. Extracellular transglutaminase 2 is catalytically inactive, but is transiently activated upon tissue injury. PLoS One 3: e1861.
. 2012. Interferon-γ activates transglutaminase 2 via a phosphatidylinositol-3-kinase-dependent pathway: implications for celiac sprue therapy. J. Pharmacol. Exp. Ther. 341: 104–114.
. 1993. Follow-up of patients positive in reticulin and gliadin antibody tests with normal small-bowel biopsy findings. Scand. J. Gastroenterol. 28: 595–598.
. 2014. Potential celiac children: 9-year follow-up on a gluten-containing diet. Am. J. Gastroenterol. 109: 913–921.
. 2004. A new model for dermatitis herpetiformis that uses HLA-DQ8 transgenic NOD mice. J. Clin. Invest. 114: 1090–1097.
. 2009. Resistance to celiac disease in humanized HLA-DR3-DQ2-transgenic mice expressing specific anti-gliadin CD4+ T cells. J. Immunol. 182: 7440–7450.
. 2000. Selective expansion of intraepithelial lymphocytes expressing the HLA-E-specific natural killer receptor CD94 in celiac disease. Gastroenterology 118: 867–879.
. 2001. NKG2D receptors induced by IL-15 costimulate CD28-negative effector CTL in the tissue microenvironment. J. Immunol. 167: 5527–5530.
. 2003. Coeliac disease. Lancet 362: 383–391.
. 2004. A direct role for NKG2D/MICA interaction in villous atrophy during celiac disease. Immunity 21: 367–377.
. 2004. Coordinated induction by IL15 of a TCR-independent NKG2D signaling pathway converts CTL into lymphokine-activated killer cells in celiac disease. Immunity 21: 357–366.
. 2006. Reprogramming of CTLs into natural killer-like cells in celiac disease. J. Exp. Med. 203: 1343–1355.
. 2012. Intraepithelial lymphocytes in celiac disease immunopathology. Semin. Immunopathol. 34: 551–566.
. 2002. TCR specificity dictates CD94/NKG2A expression by human CTL. Immunity 17: 487–499.
. 2009. Tissue-mediated control of immunopathology in coeliac disease. Nat. Rev. Immunol. 9: 858–870.
. 2015. Emerging concepts in tissue-resident T cells: lessons from humans. Trends Immunol. 36: 428–435.
. 1998. Association of DAP12 with activating CD94/NKG2C NK cell receptors. Immunity 8: 693–701.
. 2005. The CD94/NKG2C killer lectin-like receptor constitutes an alternative activation pathway for a subset of CD8+ T cells. Eur. J. Immunol. 35: 2071–2080.
. 2001. The repertoire of killer cell Ig-like receptor and CD94:NKG2A receptors in T cells: clones sharing identical α β TCR rearrangement express highly diverse killer cell Ig-like receptor patterns. J. Immunol. 166: 3923–3932. 2006. The biology of interleukin-2 and interleukin-15: implications for cancer therapy and vaccine design. Nat. Rev. Immunol. 6: 595–601.
. 2015. Cysteinyl leukotrienes mediate lymphokine killer activity induced by NKG2D and IL-15 in cytotoxic T cells during celiac disease. J. Exp. Med. 212: 1487–1495.
. 2009. Cytosolic PLA2 is required for CTL-mediated immunopathology of celiac disease via NKG2D and IL-15. J. Exp. Med. 206: 707–719.
. 1999. An activating immunoreceptor complex formed by NKG2D and DAP10. Science 285: 730–732.
. 1998. HLA-E binds to natural killer cell receptors CD94/NKG2A, B and C. Nature 391: 795–799.
. 1998. HLA-E is a major ligand for the natural killer inhibitory receptor CD94/NKG2A. Proc. Natl. Acad. Sci. USA 95: 5199–5204.
. 2013. IL-15 in tumor microenvironment causes rejection of large established tumors by T cells in a noncognate T cell receptor-dependent manner. Proc. Natl. Acad. Sci. USA 110: 8158–8163.
. 1993. Activated T lymphocytes in the celiac lesion: non-proliferative activation (CD25) of CD4+ α/β cells in the lamina propria but proliferation (Ki-67) of α/β and γ/δ cells in the epithelium. Eur. J. Immunol. 23: 505–510.
. 1992. Oligoclonality of human intestinal intraepithelial T cells. J. Exp. Med. 175: 57–63.
. 1993. Human intestinal intraepithelial lymphocytes are derived from a limited number of T cell clones that utilize multiple V β T cell receptor genes. J. Immunol. 150: 5144–5153.
. 2010. Targeting interleukin-21 in immune-mediated pathologies. Curr. Drug Targets 11: 645–649.
. 1990. Differential expression of the HLA class I multigene family by human embryonal carcinoma and choriocarcinoma cell lines. J. Immunol. 144: 1080–1087.
. 2006. Human leukocyte antigen-DQ2 homozygosity and the development of refractory celiac disease and enteropathy-associated T-cell lymphoma. Clin. Gastroenterol. Hepatol. 4: 315–319.
. 2003. Celiac disease association with CD8+ T cell responses: identification of a novel gliadin-derived HLA-A2-restricted epitope. J. Immunol. 170: 2719–2726.
. 2008. Gliadin activates HLA class I-restricted CD8+ T cells in celiac disease intestinal mucosa and induces the enterocyte apoptosis. Gastroenterology 134: 1017–1027.